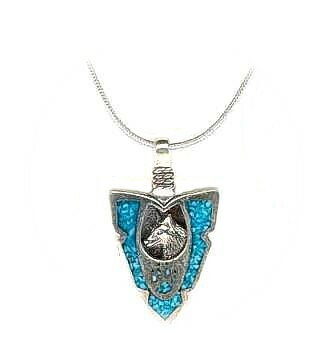 Chunky Sterling Silver Arrowhead inlaid with turquoise and intricate detailed wolf head. In Navajo legend, the arrowhead signifies alertness and the wolf is the pathfinder or teacher. Guardian of the east direction - where the sun rises.The wolf also personifies creativity, understanding and forward thinking. Pendant size 2.5cm x 2cm (1" x ¾") - complete with an 18" Silver Snake chain.